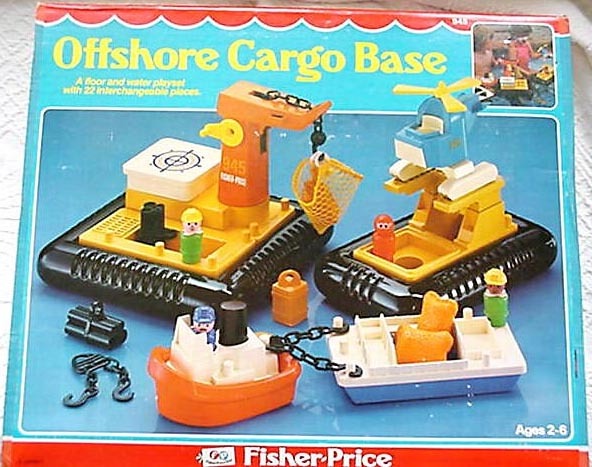 Description: The Offshore Cargo Base set is the only large Little People set that was designed for land and water, and did not have a large base. This set can be arranged several ways due to the interchangable platforms and floating pontoons that serve as this sets base. 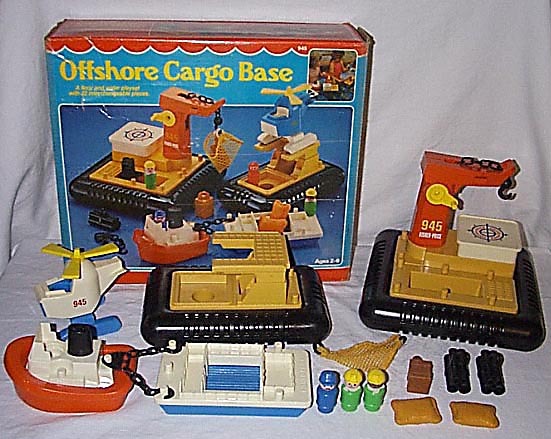 The accessories, totaling 22 pieces, include a tugboat, barge, helicopter, serveral pieces of cargo, and 4 Little People figures to complete the set. B945A - Orange rectangular barge with a tall red pivoting crane attached. 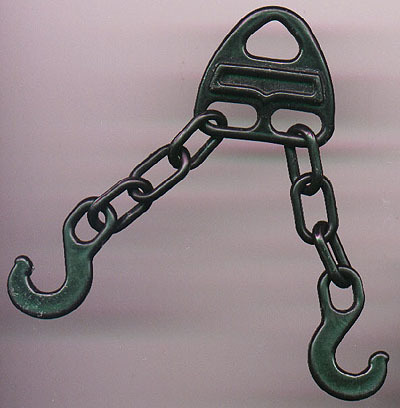 The crane has a yellow hand crank handle on the side that makes an attached black crane chain (with hook on end) move up and down. The side of the crane is marked "945" in yellow, and "Fisher-Price" in white. The barge has a deep square cargo storage bin (located under crane hook), and the back of the barge has 2 vertical male pegs (to attach fpt271 chain hooks). FPT598 - Orange rectangular barge with an attached helicopter deck / landing pad on top. The barge has a square recessed cargo bin (hole in bottom center of cargo bin). 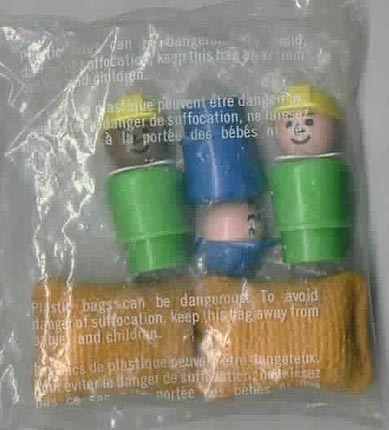 The back of the barge has a raised imprint marked "FISHER-PRICE" and has 2 vertical male pegs (to attach fpt271 chain hooks). FPT829 - Orange rectangular plastic sea "barge" with 6 vertical male pegs around the edges (to attach the fpt271 chain hooks). Has a rectangular cargo bin in the center, water drain grill imprint on one end, and a raised imprint marked, "FISHER-PRICE" on the other end. FPT830 - Square, flat white plastic cargo cover that has a blue and red imprint of a compass on the top surface. Size: 4" wide x 4" long x ??" tall. FPT827 - A black SQUARE "ribbed" hollow (in center) ring surrounds the cargo crane Base or the cargo Storage Bin and allows it to float in water. Any of the three tan bases (cargo holding dock, helicopter deck, or crane base) fit into this ring. Size: 8" wide x 8" long x ??" tall. FPT828 - A black RECTANGULAR "ribbed" hollow (in center) ring surrounds the cargo crane Base or the cargo Storage Bin and allows it to float in water. Any two of the three tan bases (cargo holding dock, helicopter deck, or crane base) fit into this ring. Size: 8" wide x 12" long x ??" tall. FPT570 - Red base, white top 1-seat tugboat with a black smokestack. The side of the smokestack is marked "945". This tugboat has a knob on the back for the FPT271 tow chains connect to. FPT571 - Large rectangular cargo barge with a Blue base and White top. This barge has 6 knobs on the sides that the FPT271 tow chains connect to. 2 each - FPT271 - Black plastic connector with 2 attached link-style chains that have a grappling hook on the end. 2 each - FPT285 - Square brown plastic "wood-slat" sided crate that has a lifting hook molded onto the top. 2 each - FPT912 - Rectangular tan plastic simulated "burlap" feed bag/sack. The feedbag has 2 rectangular pieces molded together in the middle, having a seam on all 4 edges of the feed bag. The feed bag is squeezable. Overall size: 2-1/4" long x 1-1/2" wide x 3/4" thick. 2 each - FPT270 - Black plastic set of 4 stacked "sewer-line" pipes with a lifting hook on the top. Measures 1-1/8" wide, 2-3/8" long, 1-3/4" high (including loop on top). FPT268 - Tanish-yellow soft vinyl mesh rope cargo net that has black plastic loops on both sides. ARPP - Tall blue captain with a blue angled style engineer cap and a black moustache. BYPP - Green construction worker wearing a yellow hard hat, and a white non-triangular scarf. BZPP - Green African-American construction worker wearing a yellow hard hat, and a white non-triangular scarf. DGPP - Orange deep sea diver. This figure has a red body and head with only his eyes showing, and is also exclusive to this set. FPT804 - Blue 1-seat "boxy-style" helicopter with white floater landing gear, yellow propeller (3 rotor blades), and NOT marked. FPT576 - White 1-seat "boxy-style" helicopter with white floater landing gear, yellow propeller (3 rotor blades), and marked "945" in yellow on the side. FPT806 - White 1-seat "boxy-style" helicopter with white floater landing gear, yellow propeller (3 rotor blades), and NOT marked. This set was sold in a 19" long, 6" deep, 14" high box. The black pipe bundles used in this set were also used in another set, 1983's Construx #576 Action Vehicles Set. The brown crate with a lifting loop on the top was also used in a Construx set, 1983's #575 Sea / Land Adventure Set.